↑ 1.0 1.1 Sun G. et al 2002. 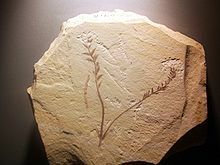 Archaefructaceae, a new basal Angiosperm family. Science 296(5569): 899–904. ↑ Friis E.M. et al 2003. Archaefructus – Angiosperm precursor or specialized early angiosperm? Trends in Plant Sciences 8: 369–373. ↑ Ji Q. et al 2004. Early Cretaceous Archaefructus eoflora sp. nov. with bisexual flowers from Beipiao, Western Liaoning, China.PDF (3.11 MiB) Acta Geologica Sinica 78(4): 883–896. This page was last changed on 29 June 2015, at 22:01.